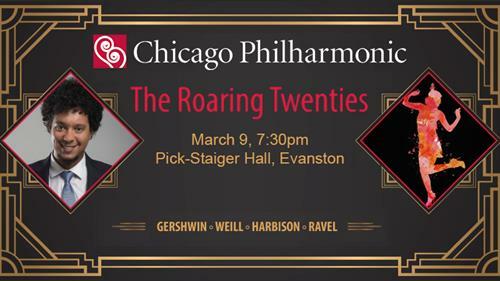 Dust off your glad rags, brush up your Charleston, and step back in time with Chi Phil to a golden era of decadence and fun. Kurt Weill’s Suite from The Threepenny Opera encapsulates the seedy underworld of the gangster antihero Mack the Knife through the eyes of Weill’s 1920s Berlin. Rounding out the program is living composer John Harbison’s Remembering Gatsby, inspired by Scott Fitzgerald’s great novel. Chicago Philharmonic joins orchestras around the world in commemorating Harbison’s recent 80th birthday. Award-winning Cuban jazz and classical pianist Aldo López-Gavilán joins the Chicago Philharmonic with his “dazzling technique and rhythmic fire” (Seattle Times). López-Gavilán has impressed audiences across the world with classical repertoire, jazz improvisation, and his own original compositions. Call 312-957-0000, email info@chicagophilharmonic.org, or visit our website at chicagophilharmonic.org. Tickets $25 - $75. Student tickets $10-$34.